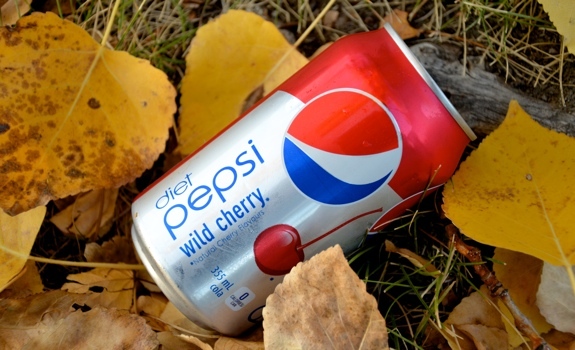 A can of Wild Cherry Diet Pepsi, nestled amongst the leaves. When I reach for a low-cal beverage (other than water, naturally), I typically grab a bottle of Coke Zero. I prefer Coca-Cola to Pepsi, so translating that preference to the low-calorie cola world is logical enough. But I’m also one of those long-suffering Canadians who has a fondness for cherry colas, a terrible affliction given their lack of easy availability north of the border. Sure, if you hit an import shop, you might luck upon a can of Cherry Coke from the UK; but compared to our friends in the States, we have limited options. Hell, our American cousins even have Cherry Coke Zero, a drink I’ve yet to see in Canada. Why, why, why? And so, the cases of Wild Cherry Diet Pepsi I found – on sale, no less – at my local Calgary Co-op store were a gleeful discovery. I don’t know just how long Wild Cherry Diet Pepsi has been around for in Canada, but I, for one, welcome this new version of a classic cola flavour. The Look: Keeps with the Pepsi theme, but adds red and features an illustrated cherry on the packaging. The Taste: Nothing subtle about the cherry taste. It jumps up and yells, “Hey! Cherry here! Helloooo! Can you taste me? I’m cherry! Cherrrrrry!” The artificial sweetener is obvious, and the Diet Pepsi base takes a backseat to the dominant cherry. The diet version stands up reasonably well to non-diet Wild Cherry Pepsi, which is equally sweet, but has a thicker, heavier texture. I prefer Cherry Coke Zero, but that isn’t exactly available in Alberta shops, so the point is moot. The Spike: Yeah, it’s pretty good with the addition of a bit of rum. You could probably have some fun mixing fruity cola cocktails with it. Nothing to see here, really. Poured over ice, Wild Cherry Diet Pepsi looks exactly like regular Diet Pepsi. Cost: $3.33 for a 12-pack of 355 mL cans, on sale at Calgary Co-op. Value for cash money: At that price, great. At the regular price, par for the course. Availability: When I bought it a couple months back, not hard to find. Now? Impossible. According to the Pepsi Canada Twitter feed, this was a limited-time thing in Canada. Damn! Nutrition? : Per can (355 mL): 0 calories, 0 grams of fat, 40 mg of sodium, 0 grams of fibre, 0 grams of protein. So, basically, there’s nothing there aside from the caffeine, which clocks in at 38 mg per 355 mL can. The verdict: Not Cherry Coke Zero, but still worth buying. I’m just about done my second 12-pack. 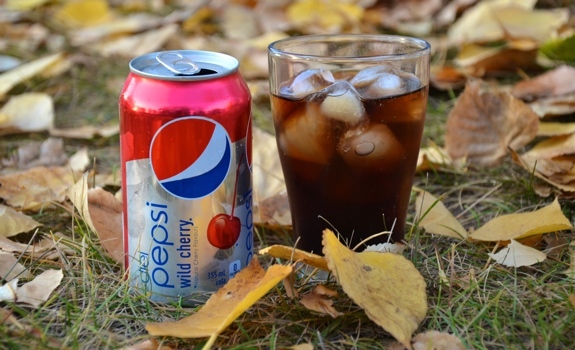 DIET PEPSI WILD CHERRY IS MY ABSOLUTE FAVORITE DRINK! IVE STRUGGLED WITH MY WEIGHT ALL MY LIFE AND WHEN I CHANGED TO DIET PEPSI WILD CHERRY IVE BEEN ABLE TO KEEP THE WEIGHT OFF ITS THE ONLY DRINK IVE BEEN ABLE TO DRINK THAT IS DIET.